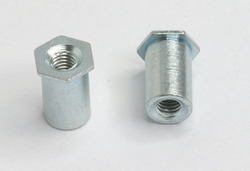 We are engased to offering VMC Machined Components. We offer products in market with affordable price. To gain strong foothold in this industry, we are devoted to offer a wide gamut of Hex Standoff. Only high quality raw material is used while manufacturing the offered range, for increased compliance with international standards of quality. The offered range is highly appreciated among clients for its various quality features and cost-effectiveness. Our range is stringently tested on various parameters to assure it on counts of quality. We are fruitfully ranked amongst the top manufacturers, exporters, and suppliers of an inclusive gamut of Stainless Steel Shaft. These shafts are processed with the aid of perfect quality components which is taken by our procurement agents form reputed vendors. Our offered shaft is smoothly examined by our quality specialist. We offer these shafts to our customers in a bulk quality.